Aubrielle sets out to uncover why Black Desert Online isn't your average MMO. Fluent takes us back to the past in his new retrospective article for Asheron's Call. MMORPG News - MMORPG Gaming: The Ultimate Nerd Expression? The Elder Scrolls Online has a new trailer for Elsweyr. The Khajiiti homeland is under attack and it's up to you to defend it from dragons, undead, Imperial Necromancers, and more. Overcome new and exciting challenges as you venture into Elsweyr. Explore fertile grasslands with stalking predators, winding canyons whose shadows hide bandits and worse, and wild borderlands where the Khajiit grow their famous moon-sugar crops. Experience all of this and more in The Elder Scrolls Online: Elsweyr. Pre-purchase The Elder Scrolls Online: Elsweyr now to gain immediate access to the otherworldly Rahd-m'Athra Mount, the base Elder Scrolls Online game, the Morrowind and Summerset Chapters, plus get the Noble Clan-Chief costume, Blue Dragon Imp pet, Baandari Peddler Crate, and more when Elsweyr launches. Bluesnews reports that Neverwinter: Undermountain has been announced for this Spring. Neverwinter's biggest expansion arrives this Spring! Team up with Durnan, the proprietor of the famed Yawning Portal to seek the truth behind the mysterious visions and forces beckoning Faerûnians to the halls of Undermountain. Neverwinter: Undermountain introduces a new level 80 cap, a complete overhaul of class powers and feats, new Adventure Zones, a new Endgame dungeon, and a much more! Are you ready to enter the realm of the Mad Mage? ExpansiveDLC reports that The Wrathstone DLC will be released next for The Elder Scrolls Online. The Elder Scrolls Online website has confirmed the next DLC – Wrathstone – will be releasing soon along with Update 21. This will be the first of three DLC packs this year, along with the next major Chapter, Elsweyr. The four packs combined make up the Season of the Dragon. Wrathstone will release before Elsweyr on May 20th and will add two new group dungeons – the Depths of Malatar, and Frostvault. A new expansion has been announced for The Elder Scrolls Online which is set in Elsweyr. In "The Elder Scrolls Online: Elsweyr" the dragons return to Tamriel! "Elsweyr" is part of the "Season of the Dragon", an all-year ESO adventure. Explore sun-drenched savannahs and gorges, defend the Khajiite homeland, and command the merciless undead necromancer in the brand new chapter of the award-winning "Elder Scrolls Online" saga! @GameGrin Conan Exiles has a new DLC available called Seekers of the Dawn. Funcom has released their Conan Exiles - Seekers of the Dawn Pack DLC pack for Windows, with an Xbox One and PS4 becoming available coming soon. 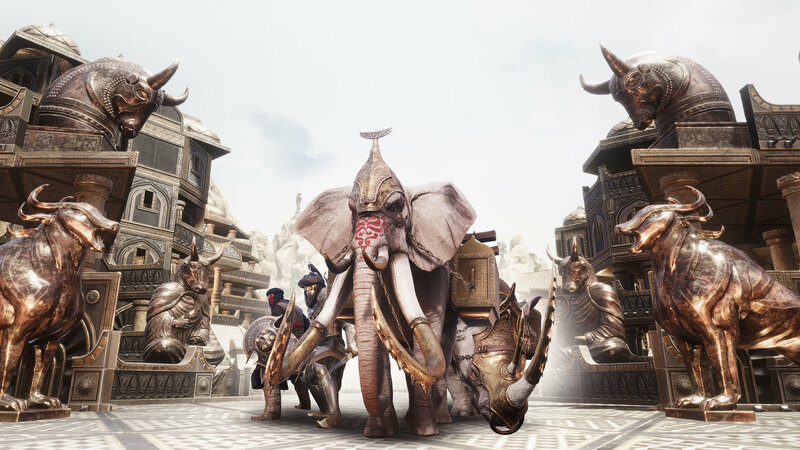 The fourth DLC release for Conan Exiles adds Yamatai themed weapons, buildings, armour and pet skins. VentureBeat interviewed Chris Roberts about why Star Citizen needed to raise 46 million in venture capital. For me, I think the investment is very important for our independence, because it gives us the ability to take our time. We have the ability to take care of our marketing and not be beholden to someone else. For the future of the company, it’s a really good sign. And it’s a good sign to show that, even at this stage, the company is worth this kind of money. As we grow and get bigger, it should only increase beyond that. That should give people who are worried about whether we’ll be around tomorrow — they shouldn’t be so worried about that. The Elder Scrolls Online: Murkmire was reviewed by Sknr. The main quests are some of the most interesting to come out of ESO in quite some time. Upon entering Murkmire you will meet an archaeologist named Famia, who’s scouring the temples to find Argonian artifacts for her museum. Her heart is in the right place, wanting to preserve Argonian culture, but it is unfortunately at the expense of taking those artifacts out of The Black Marsh. The quests you embark on with (and often times for) Famia, have a Tomb-Raideresque feel, carefully tumbling and sneaking your way past various traps throughout the temples. This definitely gives the expansion a more Raiders of the Lost Ark vibe, as opposed to the traditional sword and sorcery feeling you get by playing Summerset Isles. @YouTuber Law Crytek has lost its lawsuit against Star Citizen. In the long running lawsuit between Crytek and CIG, we finally have a resolution. Crytek's lawsuit has been dismissed by the court. Yes. It's true. Crytek can go back and amend (for the third time) the complaint, but for all purposes, this lawsuit is done. Everything has been dismissed. Let's talk. Conan Exiles dev kit has been released free on Epic Games store. From the looks of it, this is only the dev kit for Conan Exiles. Both Epic and Funcom did not clarify on the store page whether this was only the Unreal Engine 4 dev kit or not (which is a bit misleading if you ask us). After downloading it, we can confirm that it’s only the dev kit. The Murkmire DLC is available for The Elder Scrolls Online. Now available on PC/Mac free with ESO Plus™ membership or for 2000 crowns from the in-game Crown Store. Coming November 6 for PlayStation®4 and Xbox One. @WorthPlaying A new update for Conan Exiles adds pets, a new dungeon, and religion. Five months after Conan Exiles' launch, Funcom has released the biggest update since the game left Early Access. The Elder Scrolls Online 'Murkmire' impressions by GameReactor. We were also introduced to a puzzle within the dungeon - something which has been a rarity within the Elder Scrolls Online series so far. This required us to match the heights of corresponding plates that were seen on some pillars and a set of pullies. Lambert told us that this was another example of how players are trained to pay more attention to the environment in this update, as our friend offers a clue to solving it during dialogue. He also told us that this was to make things seem a lot more obvious for the player so that they don't have to search for answers online. Elder Scrolls Online: Summerset has been reviewed by RockPaperShotgun. For a game all about fluttering flower fields, gleaming spires and aloof nobility, Summerset sure is busy. Playing with a brand new character (partly so I could begin directly in Summerset, partly because I couldn’t remember much about how to play) only granted me a few precious minutes of feeling that this was a brave, new and unspoilt world. Once the short’n’stabby tutorial quest – set in some spectral other-world – was over, I emerged into the green and pleasant land of Summerset proper. Everywhere I looked, I could see people wearing silver filigree armour or robes made from obsidian thorns, sprinting about the place atop flaming panthers and giant spiders. The cumulative effect of various pre-order bonuses, paid unlocks and cross-character trophies was that almost everyone here looked like a dark god from minute one. @DSOGaming Final Fantasy XI has received an HD graphics overhaul mod. This graphics mod significantly improves the Final Fantasy XI’s textures, transforming its blurry and ugly visuals into something that is actually pleasing to the eye, that is actually able to compete with titles released a few years ago. This mod also includes optional HD Bump Maps which will greatly improve your gaming visual experience, though they require a beefy graphics card (according to the author). Ultima Online: Endless Journey is a way for players to experience the core features of Ultima Online without a paid subscription. Endless Journey accounts will have access to all pre-existing and newly created characters on all shards. To create a new Endless Journey account visit the account center. To recover an existing account check out the UO Account Recovery Video Tutorial if you having issues. If you are continuing to have issues recovering your account contact support. Please be sure to take a look at the Customer Support page for answers to some common issues and concerns.. The Ultima Store is full of helpful and vanity items to enhance your Endless Journey into the world of Britannia! If these are your first steps in Britannia, or you are returning home from an extended absence the UO Player Wiki is an excellent resource to acquaint yourself with the realm! Once in game, the Town Cryer News Network will keep you up to date with the latest goings on in the realm! Vendor search will help you find other vendors who are selling useful items to assist in your adventures! The Community in Ultima Online is its greatest resource, and there exist a variety of ways to interact including in game and Global Chat. You can check out more information on Endless Journey here. Endless Journey accounts receive complimentary access to all Ultima Online expansions through Stygian Abyss. Other expansions can be purchased and applied to an Endless Journey account. Endless Journey accounts have access to the Ultima Online core features and can enjoy exploring Britannia, training character skills, making friendships that will last a lifetime, and much more! community that has allowed Ultima Online to endure for more than two decades! Yes, character transfer tokens can be used to transfer to all shards where character transfers are eligible. Endless Journey accounts may not character copy but can access TC1. Endless Journey accounts have access to a standard player backpack and a bank box limited to 20 items ( storage expansions can increase the max item count to 28). Endless Journey accounts may not place, own, be traded, or co-own a house and may only enter public housing. Endless Journey accounts can be friended to a house for access to wall safes. Yes, Endless Journey accounts may join guilds to participate in VvV, however are not eligible to create their own guild. While in VvVEndless Journey accounts do not gain town occupation points . Endless Journey accounts may freely participate in PvP however may not use or gain the Justice Virtue and cannot protect or be protected by another player via the Justice Virtue. Endless Journey accounts may only harvest basic resources such as iron ore and regular lumbar and are not eligible for double resource bonuses in Felucca. Endless Journey accounts may use pack animals to assist in their harvesting efforts and can receive Mondain’s Legacy resource rewards. Endless Journey accounts may not use commodity deeds. Ultima Online Stygian Abyss features a new playable race, the Gargoyles, a new realm known as Ter Mur, and a new dungeon named Stygian Abyss. This dungeon is the largest in Ultima Online to date, with new monsters, tricks, and treasures. Ultima Online Stygian Abyss includes three new skills, pets, craftables, items and housing design tiles.